One of Wycliffe’s followers, Jan Hus, actively promoted Wycliffe’s ideas: that people should be permitted to read the Bible in their own language, and they should oppose the tyranny of the Roman church that threatened anyone possessing a non-Latin Bible with execution. 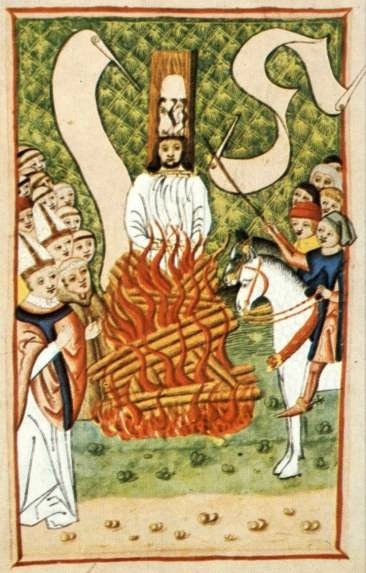 Hus was burned at the stake in 1415, with Wycliffe’s manuscript Bibles used as kindling for the fire. 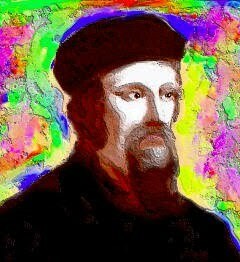 The last words of John Hus were that, “in 100 years, God will raise up a man whose calls for reform cannot be suppressed.” Almost exactly 100 years later, in 1517, Martin Luther nailed his famous 95 Theses of Contention (a list of 95 issues of heretical theology and crimes of the Roman Catholic Church) into the church door at Wittenberg. More (of course) here. I like this little series. Is today "Reformation Day," and if so, why? Is today the anniversary of the 1517 date? (Never mind, I just looked it up – October 31. (Ah. "All Saints" church in Wittenberg, and the patronal feast the next day when lots and lots of people would be coming to services. Luther may have chosen Oct 31 (the eve of All Saints Day) to nail his 95 Theses to the door of the church because the name of that particular parish was All Saints. It looks like the idea of celebrating the birth of the Reformation on Oct 31 didn't catch on until at least 100 years later. This former Moravian, who now serves as an Episcopal priest, thanks you for including Jan Hus! he certainly fanned the flame into a blaze, which by God's grace, shall never be put out.